Kombucha is a fermented tea beverage that is purported to have many health benefits, and I find it utterly delicious. Kombucha is expensive as hell, running between $2.75 and $4.00 for a sixteen-ounce bottle. As it’s a fermented beverage, it requires certain cultures to brew. A kombucha mother is that culture. 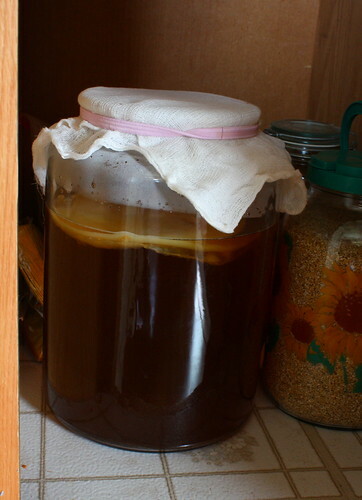 It’s a SCOBY – Symbiotic Colony of Bacteria and Yeast. Now that I have my own mother, I can brew my own kombucha for only the expense of the tea, sugar and flavorings required. It took about a month and a half to grow a large, healthy mother following this pretty adorable and informal video. I want to invite those two kids over for dinner and make them soup and just watch them be for a few hours. Maybe leech some good vibes from them. Not being a patient person, the “waiting for the mother to grow” part was difficult. Now, though, I’ll have a batch of fresh kombucha to bottle up every week or so. Mothers typically take longer to grow during the winter, when things aren’t quite so warm and toasty. We keep our heat pretty low when we’re out of the house or asleep (58 F) and bring it up to about 65 F when we’re here and away. She grew much more quickly when spring temperatures began warming things up nicely. I suspect it would only take a couple of weeks to grow a mother if the temperatures are in the seventies. The mother is the white, mat-like thing floating at the top. It’s a really interesting mixture of interwoven colonies and sheets. The medium she’d been growing in for the last half-dozen weeks is also drinkable , although it tastes a lot like apple cider vinegar due to the sheer amount of time and fermentation that’s taken place. Not to be deterred, though, I added a bunch of grated fresh ginger, a dollop of sugar and bottled it up to see if it can be make into something tasty over a few days’ bottled fermentation. If not, I’ll have a great rinse for my hair. I decided to do things right from the outset and buy a case of CZ (swing-top/Grolsch) bottles for my kombucha. Plastic bottles are full of nastiness that the acidic environment would leech out into the beverage, and I don’t necessarily trust re-using the screw-tops on glass soda bottles. Too, there’s always the possibility (however slim) that completely-sealed bottles of kombucha may explode from too much pressure. The swing-tops would allow such pressure to slowly vent, if necessary, while retaining enough of a seal to ensure good carbonation. The case of swing-tops was only about $25, including lids, found at a local brewing store. I also picked up a three-gallon glass jar for the primary fermenting vessel, and that was about $20. So, for less than $50 (about the price of twelve servings of commercial kombucha,) I’ve got a complete setup that will last years and years. I can go through twelve, sixteen-ounce servings in just over a week, so the investment seems easily worth it. I’ll let you know how the growth medium bottles turns out in a few days, and then how the first official batch goes in a little less than two week (seven to ten days for the primary fermenting, and then another two to three in the bottles to make it fizzy.) I plan to try adding some different fruits to the coming batch – blueberries, lemon, pears, raspberries – to see what I can pull off, and I’ll always make some ginger-flavored, too. I cannot get enough ginger. Here is the video series I followed – I really like the woman who did them: Make Your Own Kombucha. 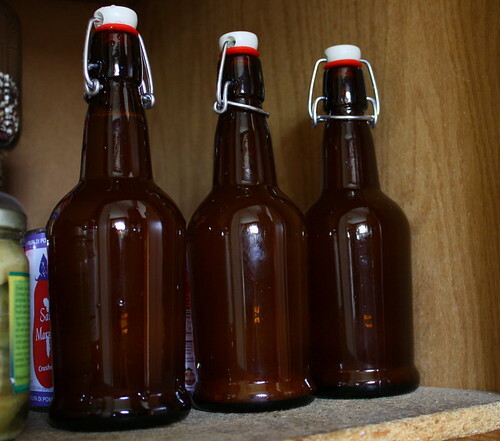 Like so many do-it-yourself home-brewing projects, this is not rocket science; it’s even easier than brewing beer, because it requires less precision and the end product can be tasty even if left for longer than it normally would be. No fancy equipment required, no surgically-sterile conditions needed – just use common sense, clean utensils and vessels. I think I may try to make my own buttermilk culture next.